The more I thought about it, the weirder it seemed. 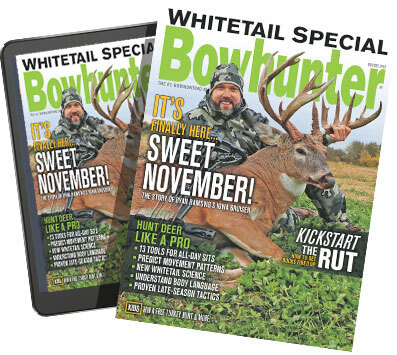 In my 15 years as assistant editor of this magazine, I'd never hunted whitetails in Canada. I'd bowhunted north of the border for black bears, caribou and moose, but never for whitetails. So, when I got an invite from Mossy Oak Director of Marketing Dustin "Shed" Whitacre to hunt deer in Saskatchewan with him in October 2015, how could I possibly say no? We would be hunting with Brandon Schreiber's Buck Country Outfitters, one of Saskatchewan's premier operations located in the tiny town of Goodsoil. This hunt would be filmed for Bowhunter TV, so joining me was my good friend and cameraman Bob Theim. To get to Brandon's place, you can fly into either Edmonton and then drive 4½ hours northeast to Goodsoil, or into Saskatoon and then drive 4½ hours northwest to camp. We ended up going the Edmonton route. Shed and I had hunted together in the past, so I was not only looking forward to my first Canadian deer hunt but also getting the chance to share camp with a guy who is a real hoot to be around. The hunt was scheduled for October 18 — 25 — a time of year when the weather can be fickle. Seasonal temps typically range from lows in the 30s to highs in the 50s, but it isn't uncommon for a sudden cold snap to plummet temperatures to near zero. So I was advised to bring enough clothing to cover the gamut, especially since I would be sitting in a ground blind from dark to dark each day. At first I wasn't quite sure why I'd be sitting all day, every day, given the time of year. Then it occurred to me that baiting deer is legal in Saskatchewan, and it's the preferred method of hunting for most if not all of the province's outfitters, including Brandon's operation. And, while deer could show up at the bait at any time of the day, peak activity at the bait sites was typically between 10 a.m. and 2 p.m., which is why all-day sits were necessary. This would be my first experience with hunting deer over bait — alfalfa to be exact. I know a lot of hunters don't agree with the practice, and I myself have always sort of been on the fence about it. But I'm also not one to argue with any method of hunting, so long as it is legal. The number-one reason for Brandon's use of bait is the vast Canadian bush his clients are hunting. How vast? Well, according to Brandon, he has access to approximately a half-million acres of Crown Land. By using bait, Brandon and his guides are able to draw deer in to specific areas and keep them coming back, thus increasing his clients' chances for a close, ethical shot opportunity at a mature buck. Buck Country's lodge alone is worth the trip. Arriving in camp on October 18, I was immediately blown away by the accommodations. The lodge is nothing short of spectacular, and it quickly became apparent that Brandon and his great crew of guides and cooks (don't get me started on the culinary skills displayed by Brandon's new bride, Amanda, and his partner Dean Kuypers' wife, Janda, during my stay there) work together like a well-oiled machine to make sure everyone in camp has a great hunt, and a memorable experience all the way around. After a good night's sleep, we awoke Monday morning and were treated to a fantastic breakfast and a packed lunch that included a Thermos of homemade soup. My guide the first day was a young man by the name of Dub. He was a good-natured, big-time hockey fan, and we hit it off right away. Access to bait sites was via ATV, each of which pulled a small cart. I have to say, the way Dub handled the cart-towing quad on the narrow and winding trail in the dark was pretty darn impressive. On the ride in, I asked him what he knew about the bucks visiting this particular bait. He told me there were several good bucks there that would meet Buck Country's 140-inch minimum. Then he said, "Oh, yeah, one more thing. There's a 5x5 in here that, while he exceeds our minimum, we ask that you don't shoot him because he's only 3½, and he's got the potential to be something truly spectacular in another year or two." "Fair enough," I said. "Does he have any recognizable characteristics that will help me identify him?" "Yep&apos;¦one of his brow tines is very short," Dub said. "So if a big 5x5 comes in, please make sure you get a look at him from the front or rear before you decide to let the air out of him." Once settled into the blind, we sat there in the dark for a good hour, eagerly waiting for it to get light. It had been a while since I'd hunted in Northern Saskatchewan, and it's a different kind of quiet there — downright eerie to be perfectly honest with you. Shortly after sunrise, several does and young bucks came in to munch on the alfalfa. As this was my first experience with Canadian deer, I couldn't believe just how big-bodied they were, and I've hunted deer numerous times in the Midwest! In fact, several of the does I saw each day made the bucks back in my home state of Pennsylvania look small! Bruce Levy's buck is one of the biggest-bodied whitetails I've ever seen in person. Small bucks and does came in and out of the bait throughout the morning and into the early afternoon, keeping Bob and I entertained and alert. Then, for whatever reason, the action came to a complete stop for about two hours. Just as I was starting to doze off, Bob whispered that he saw movement off to our left. There were two bucks, and one of them had me immediately reaching for my bow. As both bucks slowly made their way to the alfalfa, I could see good mass and four long tines on each side of the bigger one. Now I just needed to make sure it wasn't the mid-140s 5x5 Dub had asked me not to shoot. Just before entering the clearing where the alfalfa had been placed, the big buck turned his head and looked right at our blind. Drat! It was the "off-limits" buck! Both bucks fed for more than 20 minutes, during which time the big buck gave me plenty of great shot opportunities. But I'd given my word not to shoot him, so all I could do was sit and watch him. He actually came back twice more that evening, as daring me to break my word. Bob and I returned to the same blind the next day, and just like the first day we had action all day long. And, the big 5x5 with the short brow tine came to the bait four times over the course of the day, too. But, we had yet to see any of the other mature bucks Dub had pictures of on his trail camera. To give us a change of scenery, Dub took us to a different bait site on the third day. Before we hopped on the ATV for the long ride through the bush to the bait, Dub gave us the skinny on the area. "For starters, you are in tight to the bait — like 17 yards tight — and you won't get much footage of deer prior to them being at the bait because it's really thick in there, so you really need to be stealthy with your movements," he said. "There are a couple of good bucks in here, and there's also a buck in here that, like the other bait, we ask you not to shoot because he is only 3½. You're really going to want to shoot him too, because he has a four to five-inch droptine off his right beam&apos;¦"
Shortly after daybreak, a couple of does and fawns showed up to feed. All of a sudden the does picked their heads up, looked to my right, and then bolted out of there. My first thought was coyotes, but then Bob whispered that he could see a buck approaching through the thick brush to our right, and it appeared to be a good buck. Slowly, I picked up my bow and clipped onto my D-loop. When the dark-horned buck reached the bait, he turned and looked at us and, you guessed it, it was the droptine buck. This was only the third droptine buck I'd seen in person in almost 30 years of bowhunting, and it took all I had to restrain myself from shooting him as a result. Eventually he left, and the rest of the day turned out to be slow, with only a few does and fawns seen. Day four found us at a new bait, and with a new guide — Josh Belyea — who took over for Dub because he had to attend his grandmother's funeral in Calgary. The bait was located in an area that Brandon said had not been hunted in a couple of years. It was a beautiful spot, with good visibility in every direction. My only concern was that when I ranged the bait, I got a reading of 35 yards. While that's a shot I can make, I would have much preferred something in the 20 to 30-yard range. The only visitors that day were a handful of does and fawns, and one spike buck, which made for a rather long, and at times boring sit. Still, the area looked promising, so I asked Josh if we could go back there the next day. He thought that was a good idea, and the wind would be right for it, too. He also said he would move part of the alfalfa pile closer to the blind. The next morning started out exactly like the previous day, with does and fawns and the same spike buck on the bait shortly after sunrise. As the morning progressed, more does and small bucks arrived. Bob and I hoped this was a sign of good things to come — and it was. Around 9 a.m., the deer that were feeding on the alfalfa kept looking down over the hill behind the bait. "There's got to be more deer coming," I whispered to Bob. "And judging by the way the small bucks are acting, I bet it's a bigger buck." My intuition was right, as all of a sudden I spotted a good set of dark-chocolate antlers moving from left to right on the edge of the hill behind the bait. When the buck crested the hill, the rest of the deer, save one small buck, scattered. Reaching for my bow, I had already made the decision that I was going to shoot this buck if given the opportunity. Before feeding, the heavy-horned buck started rubbing his forehead on an overhanging limb, and then he feverishly worked a scrape under the limb. It quickly became apparent that the buck wasn't going to come to the closer pile of alfalfa. I ranged him at 37 yards, and as he turned broadside, I came to full draw and bracketed his chest between my 30 and 40-yard pins. Slowly exhaling and then holding my breath, I touched off the shot and watched my Lumenok-equipped arrow streak toward his vitals. My arrow struck the buck in the shoulder, but I knew I got enough penetration to be fatal. His mule-kick reaction confirmed this, and as he disappeared over the hill, I knew he wouldn't go far. When my shaking subsided, I tried to get Josh on the handheld radio he'd given me. No response. I kept trying over the next several hours to reach Josh, but to no avail. With no deer at the bait, Bob and I took it upon ourselves to recover the buck and shoot some support footage for TV. Apparently my radio wasn't working properly, as it was nearly eight hours before we got a response from Josh. With my buck loaded in Josh's truck, we went to pick up campmate Bruce Levy, who had also shot a buck late that afternoon. When we recovered Bruce's buck, I couldn't stop shaking my head over the sheer size of his buck's body, and it took four of us to load the deer into the bed of Josh's truck. Unfortunately, Shed didn't fill his tag that week, but he saw several good bucks that I probably would have killed. He was just a little pickier than me. I can't thank him enough for giving me my first taste of whitetail hunting in Canada, and for introducing to me to Brandon and his crew, all of whom I now consider good friends.